Speedy publication of relatively trivial, and often scarcely refereed research articles in mathematics (and probably in most other academic disciplines), in journals with so-called high-impact factor, has set a rather dangerous trend of research in most of the world’s developing nations. These journals usually publish quite superficial research, sometimes for a not negligible article processing fee, the page-charge. They even ask the authors, directly or indirectly, to include extended bibliographies in their papers, obviously meant to boost the impact factor of the journal. This is a trend that may, in the long run, be a threat to the global research community, substituting “good research” with “popular research”. However this is not, at present, the most dangerous part of the system. The real threat is something more fundamental,associated with these kind of research publications. Governments in numerous developing countries are now trying to encourage research in mathematics and other scientific disciplines. For this purpose, these governments give awards, prizes and various financial incentives to their researchers. But not knowing how to evaluate the quality of research, the government bodies in these developing countries have found a very easy way out. They just add up the impact factors of the publications of the researchers applying for some national award or prize. 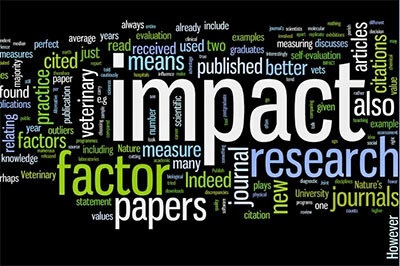 The persons with the highest sums of impact factors are declared to be the winners. This process provides strong encouragement for publishing a large number of trivial papers (there are examples of young researchers publishing 30 to 50 papers a year) in journals with positive impact factors. During the past decades the research performance in such countries has taken a very different meaning, a meaning that honors triviality, mediocrity and non-creativity. The consequence of all this seems to be that even our PhD students and young scholars no longer understand the meaning of real research in mathematics. Research for them is reduced to being able to publish a new “research article”, by simply making trivial changes in some parameters of a previously written paper. If these governments’ criteria for honoring research performance had been applied globally, then most of the Fields Medalists and Abel Prize Laureates would never have received their awards. In order to take the Pakistani mathematical community on a course of quality research and to encourage individuals who have dedicated their lives to serious research in mathematics, the National Mathematical Society of Pakistan has created the Abdus Salam Shield of Honor (ASSH) in April 2015. 2. There are people who have received all kinds of national awards and honors in Pakistan but in reality they do not deserve any recognition at all if weighed on an international scale. This is happening simply due to the lack of actual evaluation of research quality. The main research interest of the first recipient of ASSH, Hassan Azad, is Lie groups and algebraic groups and algorithms related to these fields. He also likes to think about topics of undergraduate mathematics. Currently, he is working on real algebraic groups and constructive procedures for computing their invariants, with a view towards their applications in symmetry methods in differential equations. Alla Ditta Raza Choudary is the former Director General of the Abdus Salam School of Mathematical Sciences (ASSMS), Pakistan, and is currently a Distinguished Research Professor in the Mathematics Department at Central Washington University, USA. ← Why Have a Workshop for Women in Physics? I think that a possible way out could be the following: Research Agencies, Evaluation boards etc, instead of summing up the impact factors of the journals where the fellow they have to judge has published his articles, should check if the articles written by that fellow has received any “relevant citation”. By “relevant citations” I mean citations by internationally well-known leaders in the field (who must not be co-authors of that fellow) or in text-books (not conference proceedings) written by authors not associated with that fellow. I know that few papers reach this level of recognition but this would be a manner to stop the widespread publishing of trivial papers of which myself have written few, unfortunately….. It is indeed a very serious issue. Such articles and steps should be lead with good examples. The promotion of quality and competency spreads really good spirit and trends in the society. I would like to congratulate Prof. Hasan Azad for his many valuable contributions and recognition. shameful publication conditions imposed on young faculty graduates by institutes and so called big professors acting as head ….i was denied TTS because my two publications were not accepted within one year of IPFP tenure…the race of winning the first slot in the ranking has maddened many professors….this not only is badly affecting the quality of research but the quality of teaching is also on doldrum….i am witness of students much disappointed from teachers not taking teaching seriously. Thank you for raising this issue. Indeed the pressure to publish leads to disreputable science. Good initiative by the National Mathematical Society of Pakistan! 1) In many cases, but not always, journals with high impact factor have good peer-review system and are often trusted by reputable scientists (especially because of the current boom of predatory journals, we need to be cautious). 2) This article (especially on the part of publishing many papers) should not give justification for the laziness of some mathematicians and scientists in writing research papers. In addition, I agree that we need to write “good articles” rather than “popular trivial articles” but this should not give justification against writing comprehensible papers. I am with the author in the fight against triviality, mediocrity and non-creativity. An article about impact factor condemn this obsession and describe “How to militate such obsessions?”.